David Wallace prepared to put gas into his mo-ped yesterday at the Lex Brodie gas station on Queen Street. 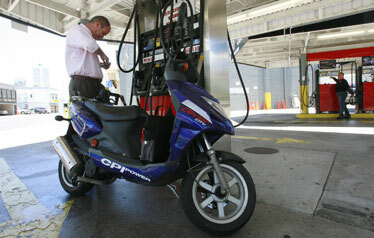 Rising fuel prices led Wallace to drive a mo-ped, which gets more than 70 miles per gallon. The higher gasoline prices get, the less some Hawaii motorists drive, according to a survey of AAA members. David Wallace spent almost $4 yesterday to fill up the 1-gallon tank of his mo-ped at a deserted gas station in Honolulu. It was a telling example of how Hawaii motorists are reacting to record gas prices, according to a survey that found drivers here are trying to avoid costly visits to the pump by spending less time on the road and switching to fuel-efficient vehicles. A survey last month of 372 AAA Hawaii members found that 46 percent are driving less than usual because of higher gas prices, with two-thirds of them combining errands in one trip and some shopping for the cheapest station when their tank dries out, officials from the automobile association said yesterday. AAA Hawaii has more than 130,000 members. The Hawaii results were mirrored in surveys done in Texas and New Mexico, with more than half of AAA respondents in both states saying they, too, were cutting down on driving. Wallace, who works as a nonprofit fundraiser and commutes about three miles from Makiki to downtown Honolulu, gave up his car and hopped onto a mo-ped last year after realizing steep gas costs were not going away. "I got it mainly for the gas but also for parking," the 44-year-old said at a Lex Brodie's station. He now spends $8 a month instead of $50 he used to pay with his Volkswagen Beetle. The AAA study came as the statewide average price of regular gas topped $4.10 yesterday, up more than 20 percent from $3.40 a year ago, according to the association's Daily Fuel Gauge Report. Richard Velazquez, regional manager for AAA Hawaii, said the survey indicates drivers — especially those earning less than $50,000 — are becoming more aware of tricks to save gas such as keeping tires properly inflated and slowing down. And, as Oahu transit officials have been noticing for a few months, 16 percent of Hawaii AAA members said they relied on another means of transportation. 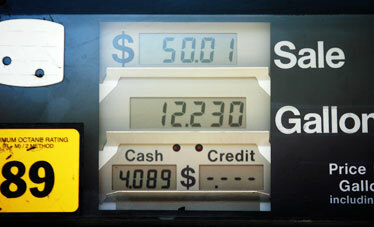 A close-up of a recent sale on a gas-pump counter. Roger Morton, president and general manager of Oahu Transit Services, said there were 86,265 bus passes in use last month as sales of $40 adult passes rose 7 percent from a year ago. Ridership for TheBoat, which reached 6,000 in March, has gone up by about 1,000 riders a month since January, said city spokesman Bill Brennan. 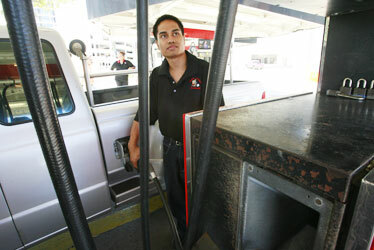 Lex Brodie's gas station attendant Eric Fulgencio pumped gas into a truck yesterday at the Queen Street location. According to Fulgencio, some vehicles cost $150 to fill. For Nini Arnold, 37, the family's ongoing move from Kaimuki to Kaneohe has led to more driving than usual — she estimated 15 trips in the past month. Arnold, like 63 percent of AAA members in the state, said she tries to conserve gas by doing all errands in one drive. Yesterday she spent $20 but did not fill up her truck on the slim chance prices would fall before it is time to swipe the credit card again. "Maybe tomorrow it will be a little bit less, or two days, or three days," Arnold said. "But it doesn't seem to happen."